We took off last week as we were trying to keep up with all of the influx of work. We’ve hired two new people to our team so that we can crank out projects faster. This week’s PHP tip uses programming to automatically detect if someone is visiting your website from a mobile device, and then give them a customized experience. Have you ever needed to visit a site from your Blackberry or iPhone? For many of us, our mobile devices are usually close by our sides. It’s often easier to make a call from your cell phone vs. a land line, as you have your entire address book handy, as well as your calendar and perhaps emails. Many people in the business world use their Blackberry, iPhone or other mobile device to access the Web. When I’m stuck in line somewhere, I like to know that I can visit CNN, New York Times or other local news websites to find out what’s going on. Sites like these have spent tremendous amounts of money coming up with mobile-optimized versions of their websites. But it’s easy to use the php programming language to automatically detect when someone is visiting your website from a mobile device, and display a more simplified version of your site. How does this work? When you visit a website, your browser gives the web server a few pieces of information to help make sure the pages that they serve to you render properly. One piece of information is the browser type. We have a database of 250+ mobile browsers that our system recognizes. When someone visits from a normal computer, the php software sends the normal version of the site. When someone is visiting from a mobile device, such as an iPhone or a Blackberry, the php script then detects this and delivers a different version of the site. Try it out: Try out our system. 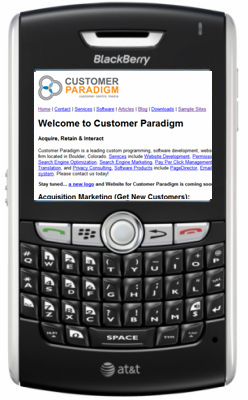 Visit the CustomerParadigm.com site from your mobile device. Or, see what our mobile version of our site looks like on a normal computer, visit here >> Why should I bother with PHP for a mobile site? One of the most common reasons why people will visit a mobile site is to find your phone number or your address. When people are late for a meeting to our office they’ll often try to visit our site to find the phone number to call us, and let us know they’re running late. Or, they might need the address to find our street numberor suite number. This is also true of retail sites, or any organization that interacts with the end consumer. If you make it easy for people to find you on the web — regardless of if they are on a cell phone, iPhone, Blackberry or a normal computer — you’ll have a lot more success. It’s a zero sum game: those that put themselves out there will win, and the businesses and organizations that don’t won’t show up.